J. Chester Badgett (January 18, 1915 – May 10, 2011) was a Southern Baptist clergyman in Campbellsville in Taylor County in central Kentucky. He was a trustee for forty-two years of Campbellsville University and also served on the board of the New Orleans Baptist Theological Seminary in New Orleans, Louisiana. He was a president of the Kentucky Baptist Convention and secretary to the Mission Board of the Southern Baptist Convention, based in Nashville, Tennessee. Born in Casey County, also in central Kentucky, he was the third of four children of Thomas Franklin Badgett (1889-1969) and the former Lelia Grace McClanahan (1892-1974). He graduated in 1931 from Stanford High School in Lincoln County, Kentucky. In 1936, he received his undergraduate degree from the Baptist-affiliated Georgetown College in Georgetown in Scott County, Kentucky. He subsequently obtained the Master of Arts and the Doctor of Theology degrees from Southern Baptist Theological Seminary in Louisville, Kentucky. Badgett's son, Dr. Thomas Badgett, recalled in 2009 that, as a child, family meal discussions consisted of mainly two items: Campbellsville Baptist Church, at which his father was the pastor from 1950 until 1980, and the CU campus. Badgett wrote Campbellsville Baptist Church: A Two-Hundred Year History 1791-1991 and The History of Campbellsville University, 1906-2006, a book that was a product of CU's centennial observance in 2006. James Edward Jones, an Alabama native who followed Badgett as the Campbellsville Baptist Church pastor, said of his predecessor: "He was one of the finest men I’ve ever known in my entire life. ... one of the greatest mission supporters ..."
In addition to Campbellsville Baptist Church, Badgett served as pastor of the Clear Creek Baptist Church in Woodford County, Little Mount Baptist Church in Spencer County, Utica Baptist Church in Daviess County, Beaver Dam Baptist Church in Ohio County, the Kowloon Baptist Church in Hong Kong, and the Bethel Baptist Church in Caracas, Venezuela. He was a member of the Taylor County Ministerial Association and was the last surviving charter member of the Campbellsville Kiwanis International, of which he was once the president. Badgett died at the age of ninety-six at Jewish Hospital in Louisville. He and his wife, the former Ruth Winifred Cloyd (1919-2009), had three children: Tony Badgett and wife Priscilla, Ruth Ann Badgett Shaw and husband Bob of Frankfort, Kentucky, and Dr. Thomas Badgett and wife Rachel of Louisville; a sister, Sue Ella Gelhausen (1930-2015) and husband, Victor, of Stanford, Kentucky, five grandchildren and seven great-grandchildren. He was preceded in death by two brothers, Faulkner Badgett (1910-1965) and William Wesley Badgett (1912-1989). Upon Badgett's passing, W. R. Davenport, the president from 1969 to 1988 of Campbellsville College, as it was then known, cited King David of old Israel on the death of a trusted army commander: "'Know that a prince and a great man has fallen today. . .’ These words perfectly befit the passing of our dear friend and brother, Dr. Chester Badgett ... Campbellsville University has lost a stalwart supporter, a devoted trustee, a loyal friend, and an uncompromising champion of our cause. On more occasions than I can relate during my tenure at the campus, he rose to encourage support for us in ways that few, if any others, could have done. ..., a prince of God and a great man has passed from among us..."
Dr. Kenneth W. Winters (born 1934) who succeeded Davenport as the CU president from 1988 to 1996 and was later a Republican member of the Kentucky State Senate, said "It would be hard to imagine anyone more dedicated to an institution and its mission than ... Dr. Badgett. He was strong supporter of my time as president of Campbellsville University and was a strong encouragement to me individually. ..."
The current Campbellsville Baptist pastor, Skip Alexander, recalled his personal relationship with Padgett: "We both started pastoring at the same age and were both graduates of Georgetown College. We both shared a passion for the lost and a commitment to the SBC Cooperative Program.” Alexander established the Badgett-Jones Scholarship at CU in 2003, the year after he became pastor. He took each recipient of the award to meet personally with Badgett: "This was a living way each semester for us to honor his legacy." In 1980, Badgett received an honorary Doctor of Divinity degree from the then Campbellsville College. Current CU president Michael V. Carter called Badgett "one of the ‘great generation’ of Southern Baptist and Kentucky Baptist leaders, and ... three decades as the senior pastor of Campbellsville Baptist Church touched the lives of thousands of people across southern Kentucky and beyond." 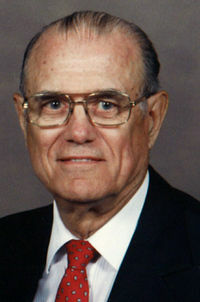 Carter said that Badgett was "a “stalwart supporter of Campbellsville University and a key member of the CU Board of Trustees for many decades. His passion for evangelism and missions, advocacy of the Cooperative Program and leadership at all levels of our denomination are legendary across the Southern Baptist Convention and Kentucky Baptist Convention." Services were held on May 13, 2011, at the Campbellsville Baptist Church with five officiating ministers, including pastors Jones and Alexander. Interment beside his wife at Brookside Cemetery in Campbellsville. ↑ 1.0 1.1 1.2 J. Chester Badgett. Findagrave.com. Retrieved on December 12, 2017. ↑ 2.0 2.1 2.2 2.3 2.4 2.5 2.6 Joan C. McKinney. Long-time trustee, Dr. J. Chester Badgett, dies at 96. Campbellsville.edu. Retrieved on December 13, 2017. This page was last modified on 5 January 2018, at 14:21.